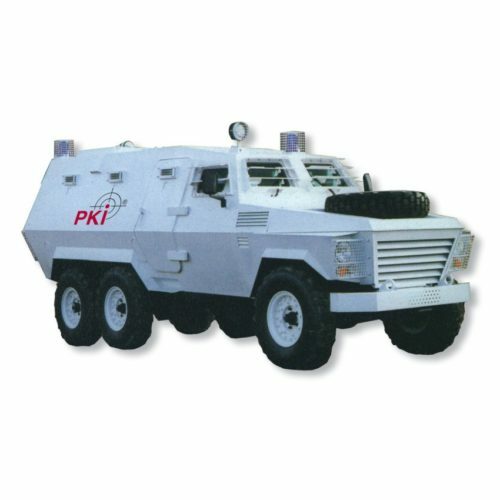 We offer various armour protected vehicles for military, paramilitary, police and bomb disposal. Please let us have your enquiry, we will offer you the appropriate vehicle specifically designed according to your requirements. General Design: The hull is a fully welded body unit complete with seats for up to fourteen persons including the driver. It is fabricated from lightweight high hardness steel armour and is bolted to the chassis. Windscreen and front windows are of laminated armoured glass with anti-splinter screens out of polycarbonate. The vehicle gives protection to the engine compartment and incorporates gun ports complete with vision blocks on each side, as well as at the rear. The doors of the driver, co-driver and rear crew are provided with internally operated shoot bolts. Special attention has been given to the design of door/door apertures to ensure full protection. The armour door overlap incorporates a double seal unit and a spall return strip to protect against petrol ingress and spall fragments. Armour: The steel armour provides ballistic immunity at 25 metres and an attack angle of 90° from ball 7,62 ammunition fired from high velocity rifles and machine guns as well as all threats lesser than that. The armoured glass/polycarbonate construction used for the windscreen and front windows is of a corresponding ballistic resistance. Additional protection for the windscreen and front windows is provided by armoured visors with incorporated vision slits which are actuated from inside the vehicle. The floor armour protects against mine fragments and grenades and, being an integral part of the monocoque hull, possesses good blast deflection characteristics. The doors are constructed of the same material as the hull and all transparent armour is glazed into armoured steel frames.